Dy CM, Chowna Mein has expressed deep shocked and sorrow over the lost of human lives and properties due to flash flood and landslides in the Twin Capital City. 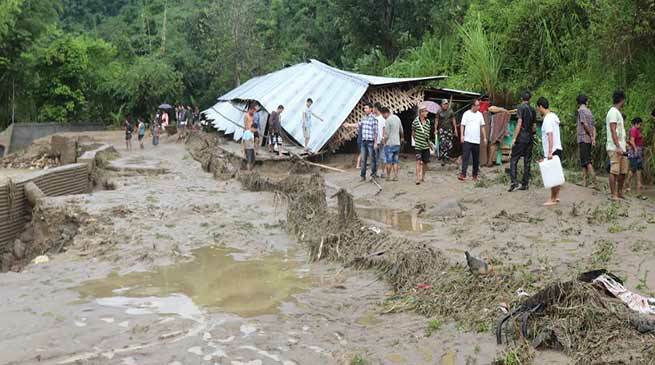 Deputy Chief Minister, Chowna Mein has expressed deep shocked and sorrow over the lost of human lives and properties due to flash flood and landslides in the Twin Capital City that was triggered by heavy rainfall over the last few days. He expressed his sympathy and deep condolence to the bereaved family members and prayed for the eternal peace of the departed souls and also prayed for early recovery of the injured persons. He summoned the DC Capital, Prince Dhawan in his office in the evening to take stock of the exact situation and instructed the DC, SP Capital and Chief Secretary Incharge, Kaling Tayeng to left no stone unturned to carry out rescue operations and to provide relief materials to the affected families. He also instructed DC Capital to rehabilitate the affected families and to vacate those residing in vulnerable places like nallahs, river banks, slide prone areas, etc to the safer places. He further appealed to the people to cooperate with the district administration in such difficult times. Meanwhile, Dhawan briefed DCM that the Capital District Administration along with the Police, NDRF, SDRF, line departments, etc have swung into action to carry out the rescue operation. He said that he along with his team visited all the incident areas and met with the victims. He further informed that many schools in the Capital Complex have been designated as temporary relief shelter and all the relief materials including blankets, vessels, utensils, etc would be provided by the District Administration and blockade points like Lobi, Donyi Polo road etc were cleared and opened for traffic, he informed.